Genuine Fijian Mahogany is BEAUTIFUL and DURABLE and above all else SUSTAINABLE! Bring the look and feel of the tropical islands right to your home with Genuine Fijian Mahogany! Why travel halfway around the globe when you can build a tropical oasis right in your own back yard! Genuine Fijian Mahogany is naturally BEAUTIFUL, its timeless elegance weathers to a stunning natural gray tone or it readily accepts stains and paints to acquire the exact look you are searching for. Like all beautiful objects Genuine Fijian Mahogany not only improves with age but its value increases due to its longevity. Genuine Fijian Mahogany is one of the few things that are never out of style! Genuine Fijian Mahogany is SUSTAINABLE, it is plantation grown similar to a crop of wheat which makes it a fully renewable resource. Our Swietenia Macrophylla otherwise known as TRUE Genuine Fijian Mahogany was planted on the Fijian Islands after World War II with the intention of being fully sustainable resource. The Fijian Mahogany forest plantations are rigorously regulated by the Fijian Government to manage the sustainability and milling process of their Mahogany. Logging is done based on the "minimal impact" concept where the least amount of damage possible is done to the surrounding areas. In this day and age with so many resources running out or being knowingly or unknowingly illegally harvested it is truly refreshing to find a beautiful, sustainable product that will maintain growth over the years and at the same time help the Fijian economy and community grow! 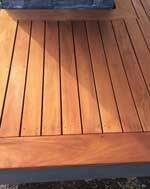 Genuine Fijian Mahogany is DURABLE, its stability is one of the most sought after characteristics for a building material especially for the wetter weather here in the Pacific Northwest. Our Genuine Mahogany is kiln dried in state of the art kilns averaging less than 11% moisture content and resists splitting and checking. Most importantly Genuine Mahogany is rated a Class II in durability and has a 20+ year lifespan with the ability to withstand rot and decay. This production is MCA treated and has passed the California Urban Interface (W.U.I.) standard. Conrad Forest Products currently offers 5/4x4, 5/4x6, 1x4, 1x6 in random lengths from 6' to 19' (odds and evens). The sale of Fijian Genuine Mahogany will lead to better education, better health conditions, and a better future for the people of Fiji.